Since a couple of weeks I have an irresistible urge to wrap things in green leaves. 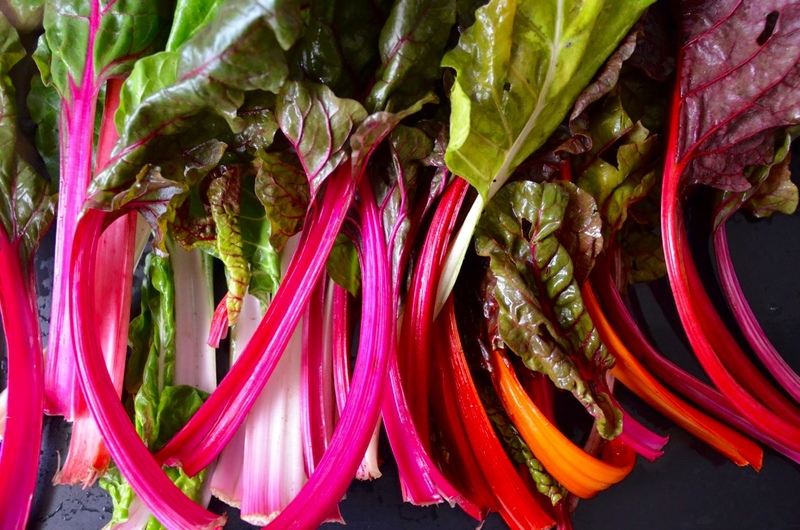 It all started with a bunch of Swiss chard. Admiring the beautiful colourful pink, yellow and orange stalks, veins and contrasting dark leaves, I thought, that there had to be a better way to do them justice, than to just wilt them down in the pan. 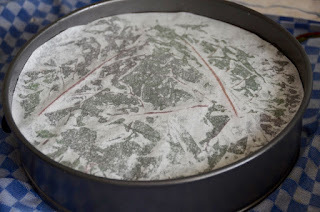 Then I remembered the Chou Farçi photo I had seen on Mimi Thorisson's blog Manger, and there was my answer (and the beginning of my leaf-wrapping addiction): Cake! Everyone loves cake! Turns out, even a green one. 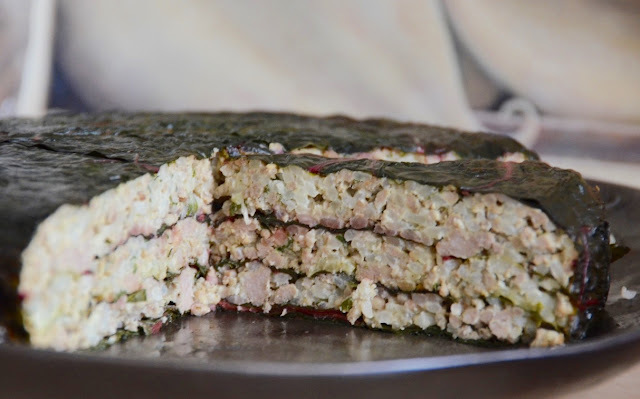 I wasn't quite sure if this would work with chard, so googled it and found an interesting Lebanese Chard cake, stuffed with rice and spices. 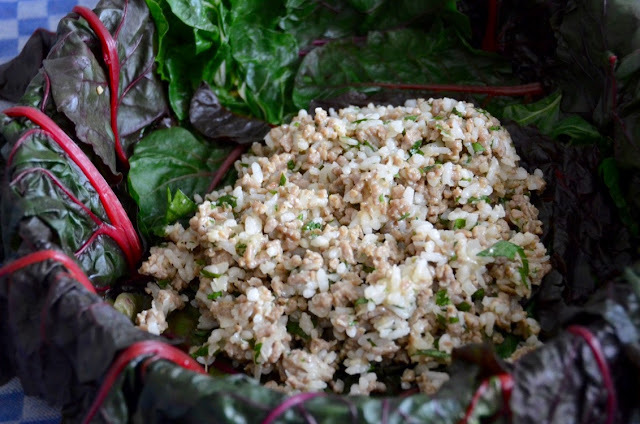 In the end, my recipe is a combination of my mum's 'Kohlrouladen' (cabbage rolls), one of my child-hood favourites, stuffed with rice and meat, Mimi's Chou Farçi, and the Lebanese Swiss chard cake, and we just love it! Swiss chard has a rather strong perfume and flavour and, due to it's oxalic acid content, is a little sharp-tasting, and so maybe not everyone's favourite. But in combination with the spicy meat and rice filling a dream. The leaves add a fantastic, unusual perfume and taste to the dish. We like it so much, that I have made it three times in one month, and we are looking forward to our next. It's also so beautiful and great for dinner parties, especially as you can prepare it in advance. 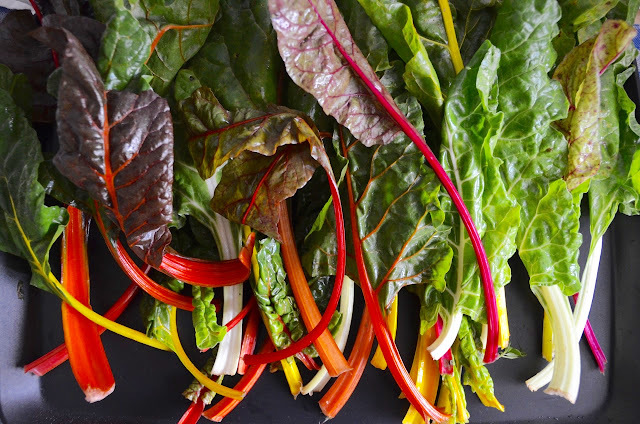 It's a little elaborate and time-consuming, and you do need a lot of chard leaves, the more the tastier, as they wilt into nothingness during cooking. 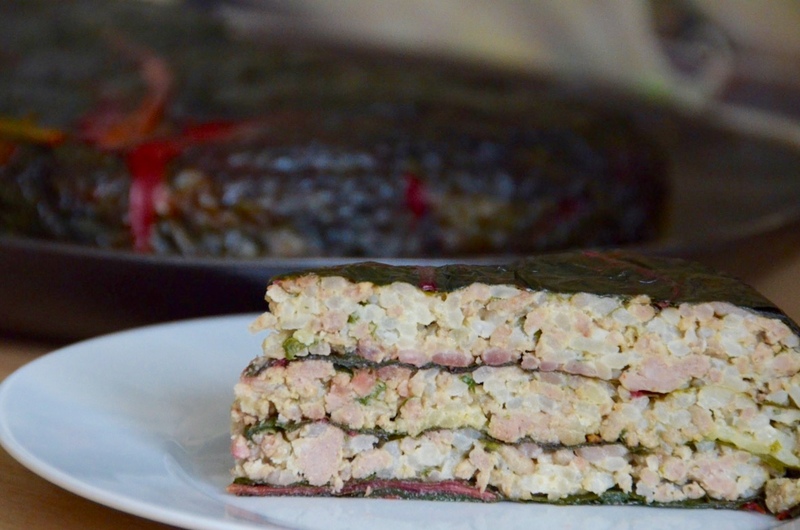 And what you don't need for the outer cake 'wrapping', you can put as layers between the rice-meat filling. Bring approx. 1 litre of water to a boil, salt, then add the unwashed rice and cook until almost done, app. 15 minutes. Drain very well, then put it into a large bowl and leave to cool. Bring water in a large pot to a boil, add salt. Add the Swiss chard leaves, a few at a time, to the boiling water and blanch until they begin to wilt, then remove them with large kitchen tongs and lay them flat to dry in a single layer on kitchen towels. Pre-heat the oven to 190°C/170°C fan/375°F. Heat some olive oil in a large frying pan. 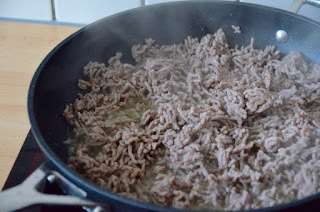 Add the ground beef, season with salt and freshly milled black pepper and fry until nicely browned and fully cooked. 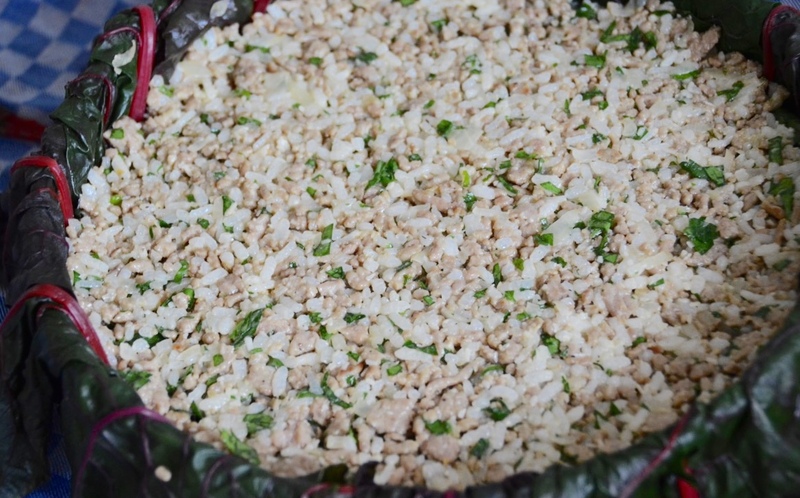 Remove the meat from the pan with a slotted spoon or spatula, add it to the bowl with the rice and leave to cool. To the same pan add another Tbsp of olive oil then gently fry the onion over medium-low heat until soft and translucent, but not browned. Add the garlic and fry for another minute. Add the fried onion to the bowl with the rice and meat and leave to cool slightly. 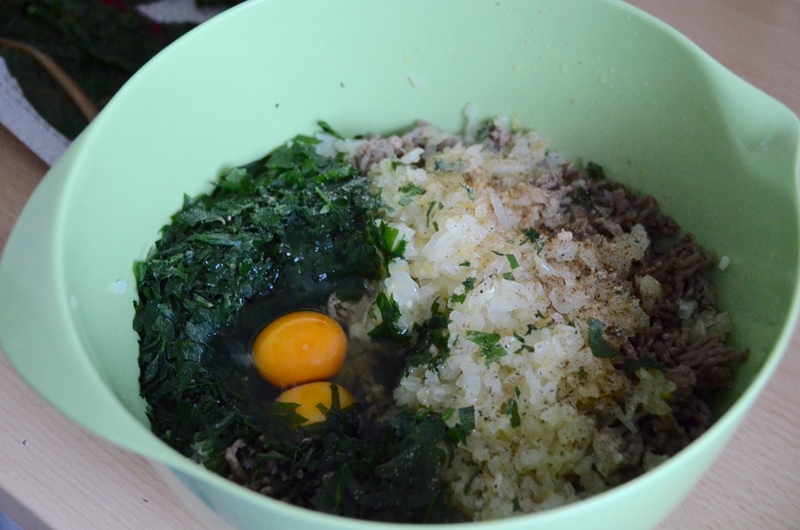 Add the egg, chopped parsley and Parmesan to the bowl with the filling, season with grated nutmeg, salt and freshly milled black pepper, and mix well. Taste and season with more salt and pepper or nutmeg if necessary. Cover the bottom of the cake tin with a disc of baking parchment, then brush the bottom and sides with olive oil. 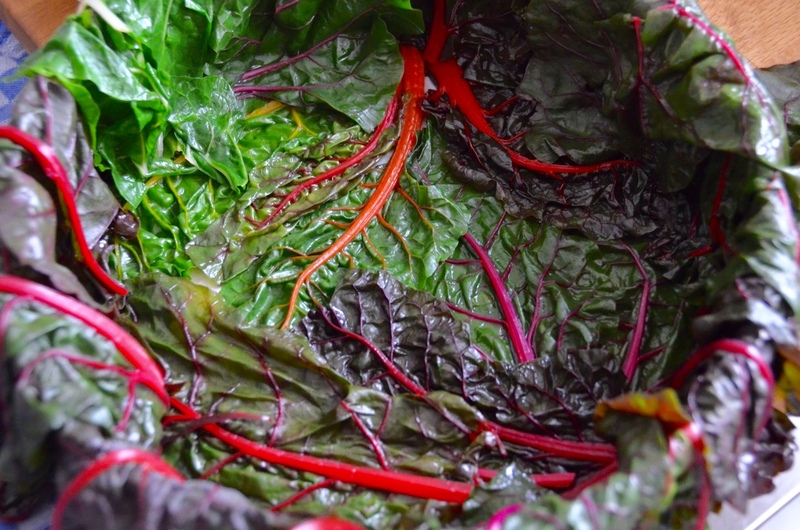 Place a couple of the nicest looking blanched chard leaves with colourful veins on the bottom of the pan (these will later become the top of the cake so be as creative as you like), then add a couple of leaves (1-2 layers) on top to cover the whole bottom. 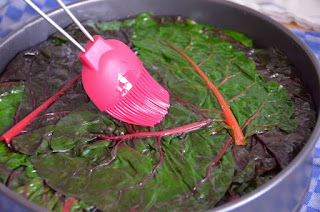 Place more beautiful large leaves along the entire rim of the pan so that they are half hanging over the sides. At the end, the rim should be completely covered with overhanging leaves, with no gaps showing along the rim. Add a third of the meat-rice filling into the tin and distribute evenly, making sure that the filling goes all the way into the rounded edge of the pan. 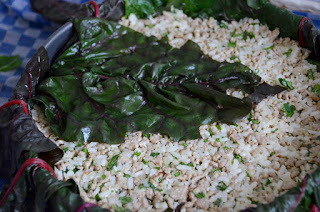 Cover with a layer of chard leaves, followed by another layer of filling, chard leaves, etc. 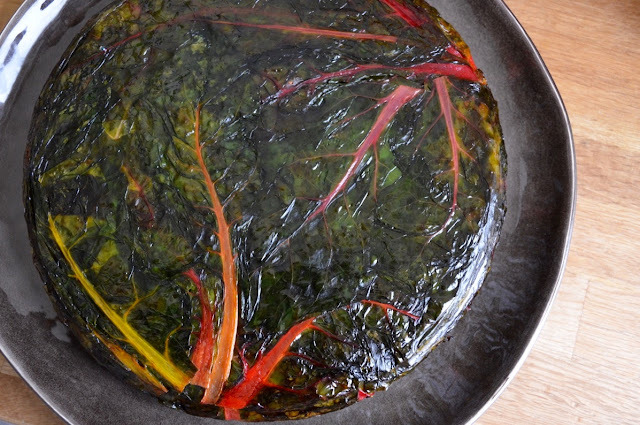 End with the remaining chard leaves on top, compacting and flattening the layers a little to make sure the cake keeps together well after baking. Finish by neatly folding the overhanging leaves over and on top of the cake, making sure that the cake is completely covered. Brush the top of the cake with a little olive oil, then cover it with a disk of parchment paper, the size of the cake tin, pressing it lightly onto the cake. This will make sure that the top leaves will be nicely steamed and not dried out during baking. Alternatively cover the tin with a layer of alu foil. Bake the cake in the pre-heated oven for 40 Minutes or until the cake can easily be pierced with a toothpick or the tip of a sharp knife, making sure that the leaves are soft. Remove the cake from the oven and leave it to cool a little inside the tin. Carefully run a small knife between the rim and the cake to make sure that the cake is not stuck, then invert it onto a large plate: to do so, first remove the outer ring, then place a large plate on top of the cake and invert both cake and plate together. Serve hot, warm, or at room temperature. 1) Boil the rice: Bring approx. 1 litre of water to a boil, salt, then add the unwashed rice and cook until almost done, app. 15 minutes. Drain very well, then put it into a large bowl and leave to cool. 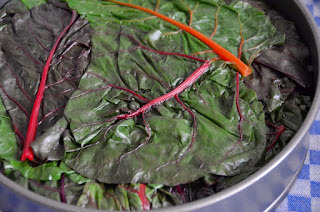 2) Blanch the chard: Bring water in a large pot to a boil, add salt. 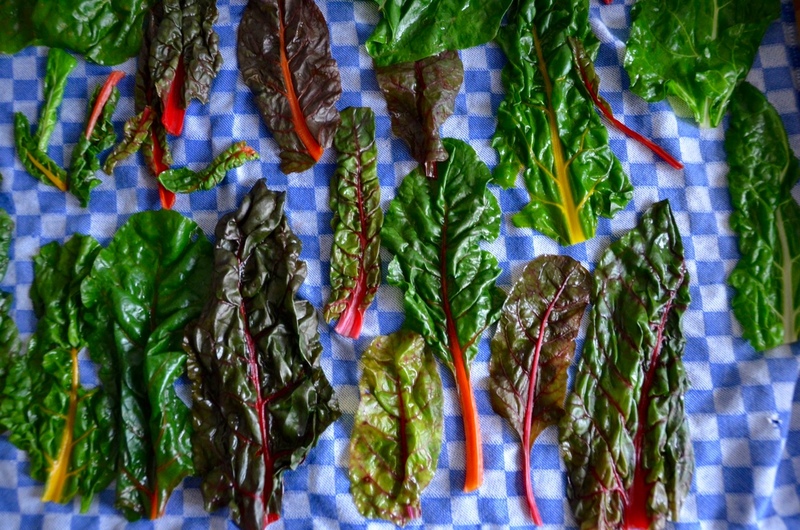 Add the Swiss chard leaves, a few at a time, to the boiling water and blanch until they begin to wilt, then remove them with large kitchen tongs and lay them flat to dry in a single layer on kitchen towels. 3) Pre-heat the oven to 190°C/170°C fan/375°F. 4) Fry the meat: Heat some olive oil in a large frying pan. Add the ground beef, season with salt and freshly milled black pepper and fry until nicely browned and fully cooked. 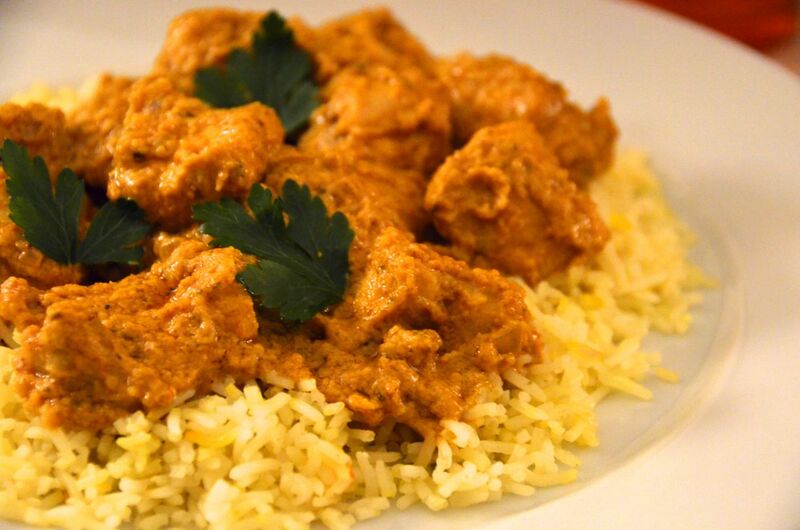 Remove the meat from the pan with a slotted spoon or spatula, add it to the bowl with the rice and leave to cool. 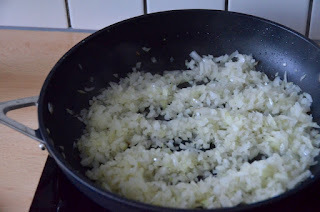 5) Fry the onion and garlic: To the same pan add another Tbsp of olive oil then gently fry the onion over medium-low heat until soft and translucent, but not browned. Add the garlic and fry for another minute. Add the fried onion to the bowl with the rice and meat and leave to cool slightly. 6) Add the remaining ingredients and season: Add the egg, chopped parsley and Parmesan to the bowl with the filling, season with grated nutmeg, salt and freshly milled black pepper, and mix well. Taste and season with more salt and pepper or nutmeg if necessary. 7) Assemble the cake: Cover the bottom of the cake tin with a disc of baking parchment, then brush the bottom and sides with olive oil. Place a couple of the nicest looking blanched chard leaves with colourful veins on the bottom of the pan (these will later become the top of the cake so be as creative as you like), then add a couple of leaves (1-2 layers) on top to cover the whole bottom. Place more beautiful large leaves along the entire rim of the pan so that they are half hanging over the sides. At the end, the rim should be completely covered with overhanging leaves, with no gaps showing along the rim. 8) Cover the cake: Brush the top of the cake with a little olive oil, then cover it with a disk of parchment paper, the size of the cake tin, pressing it lightly onto the cake. This will make sure that the top leaves will be nicely steamed and not dried out during baking. Alternatively cover the tin with a layer of alu foil. 9) Bake: Bake the cake in the pre-heated oven for 40 Minutes or until the cake can easily be pierced with a toothpick or the tip of a sharp knife, making sure that the leaves are soft. Remove the cake from the oven and leave it to cool a little inside the tin. Carefully run a small knife between the rim and the cake to make sure that the cake is not stuck, then invert it onto a large plate: to do so, first remove the outer ring, then place a large plate on top of the cake and invert both cake and plate together. 10) Serve: Cut into wedges and serve hot, warm, or at room temperature. I was just gifted with about 14 Swiss chard plants for my garden (and have several already planted) and was thinking.."What am I gonna do with all this chard?!" Now I know ;) Looks delicious! Can't wait to try this recipe. Thanks! © 2012-2018 PIZZA FOR BREAKFAST. Simple theme. Powered by Blogger.